Dji is the leading drone manufacturer in the world and it has now launched a new social platform called DJI+Discover. 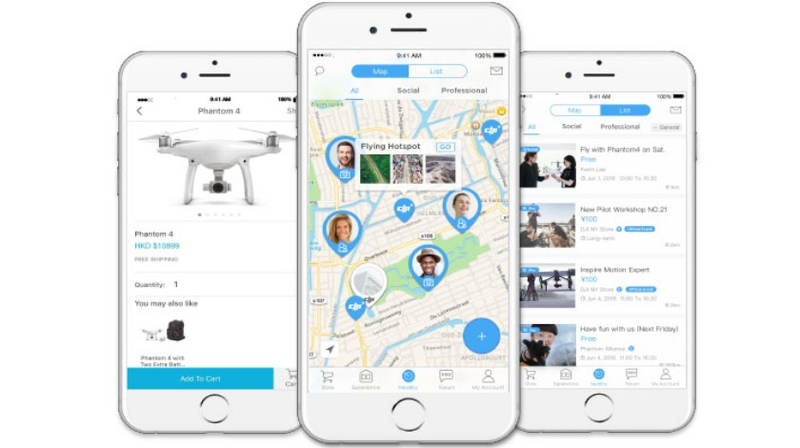 DJI new Social platform can be accesed via an iOS or Android app. The app has been made n order to connect people socially or professionally making it possible for drone-pilots or enthusiasts to start having a nice conversation , meeting up or getting together to provide a professional marketplace for drones. The app has been made because many drone-enthusiasts want to know others that share the same interests and want to share their experiences or get to know new experiences from other people. DJI+Discover has been made easy to access for everyone . It is divided in four parts: Nearby Search , Experience , Store and Forum. Users that are registering can create a profile where you can see to whom you are talking to. Another thing that is very important is the fact that the app is open to anyone from those curious about the technology to the one that have professional experience. – shows the users that are nearby and also the flying hotspots where you will probably meet others. The Nearvy Search is separated for social and also for professional users. It offers people an easy way of chatting and meeting up , and for professionals it can introduce you to possible partners. – this section is especially made to publish nearby events and also big events that may not be as known as they should. It also has information about nearby stores which can also be helpful. – is simply a section that takes you to the DJI’s online store. – Can be used to discuss bigger themes about which you can chat with a friend. Here you can see bigger themes and more tips and opinions from a wider range of users with which you can also directly interact. So all in all the DJI new Social platform is a very useful app that is 100% free. The only downside it has for now is the fact that it is currently only available in the US , the UK , Germany , Spain and Australia but is probably gonna be extended in the near future.